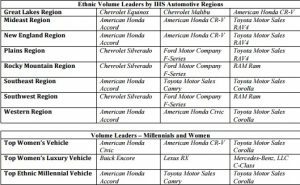 DETROIT, Mich., Jan. 5, 2016 /PRNewswire/ — The National Association of Minority Automobile Dealers (NAMAD) and IHS Automotive, part of IHS Inc. (NYSE: IHS) and a leading source of critical information and insight to the global automotive industry, today announced the nominees for the first 2016 Diversity Volume Leadership Awards (DVL Awards). The Diversity Volume Leadership Awards will precede the North American International Auto Show on Sunday, January 10, 2016. The invitation-only awards program, reception and dinner will take place from 5:00 p.m. – 8:00 p.m. in Room 410-A at Cobo Center in Detroit. Of the top industry honors presented to automotive manufacturers, nominees for the DVL Awards have demonstrated the highest new vehicle registrations with ethnic, women and millennial consumers. New vehicle registration data from IHS Automotive has been used to determine the nominees based on 2015 model year actual U.S. personal new vehicle registration volumes (October 2014 through September 2015). This year’s awards are based on an analysis of more than 13 million personal new vehicle registrations.